Vertigo commented, of the "underground" style of poets, that "They are inspired by the beat generation, Ginsberg, etc. Most of these poets here in Cleveland worship at the altar of d.a. levy." Well, it's true-- despite all the poetry activity in Cleveland, the poet whose name is most closely associated with the city is still d.a. levy. It's worth reposting a link to Cleveland Magazine's "The Epic of d.a. levy". Levy: epic rabblerouser, or self-centered jerk? You decide. Cleveland Magazine's list of d.a. levy links. by style & form & words like "art"
The hardest working man in poetry? I just ran across Carla Thompson's post in vatic muse, saying our friend Vertigo Xi'an Xavier is "the hardest working man in poetry." Yeah, I can believe that-- the guy started the poet's haven website back when he was in high school (it's now the second-oldest poetry site on the web)-- and only took of from there. Horray for Vertigo. "Vertigo Xavier just finished publishing a chapbook, copy editing for a second chapbook, making a promotional poster, organizing a fundraiser, and updating his website. All while you were sleeping last night...."
A couple of Cleveland poets who write poetry toward the speculative direction in the geography of poetry have recently gotten reviews from Diane Severson in Amazing Stories. "This is a volume to enjoy as a brief diversion on a stormy night and also to pull out each October in preparation for Hallowe’en." At six dollars for a copy, it's a bargain for any poetry fans with an interest in haiku, or in horror. And it's not too early to start thinking of gifts to give your friends and family for World Zombie day! "I really like Mary Turzillo’s writing style. It’s less formal than many poets in her syntax and word choices, which makes it easy to read. It’s a book that could be ripped through, it’s so easy to read, but its many-layered nature benefits from a bit more leisure." Ten bad poems for every good one. Kathleen Flenniken says, "ten bad poems for every good one." On NPR, David Orr points out that, since (mostly) poetry doesn't pay the bills, poets have day jobs. In the meantime, everyone has to eat. So unless you win the lottery, being a poet means finding a job that can support the writing of poems. From banker (T.S. Eliot) to undertaker (Thomas Lynch), working at a job has in one way or another influenced their poetry, for some quite obviously, and for others more subtly. David Orr, "From Dissections To Depositions, Poets' Second Jobs." 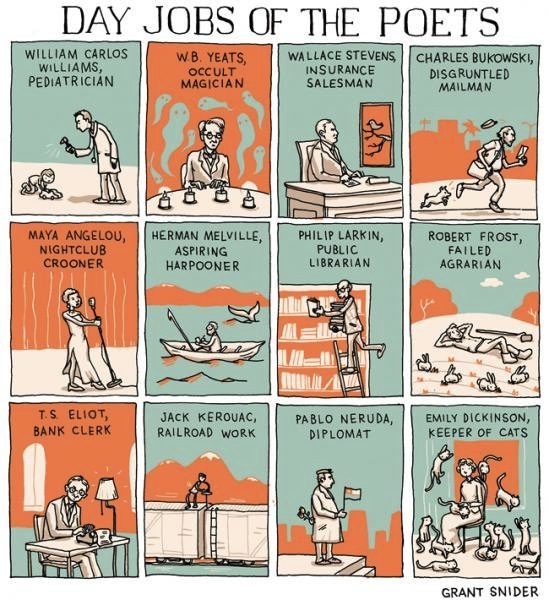 "Day Jobs of the Poets"
Ohio Poetry Day Contests open for submissions!